I fell in love with Agnes Pelton’s paintings when I attended the Channeling Agnes Pelton: Portraits, Landscapes and Readings exhibition at City Hall in Cathedral City last year. 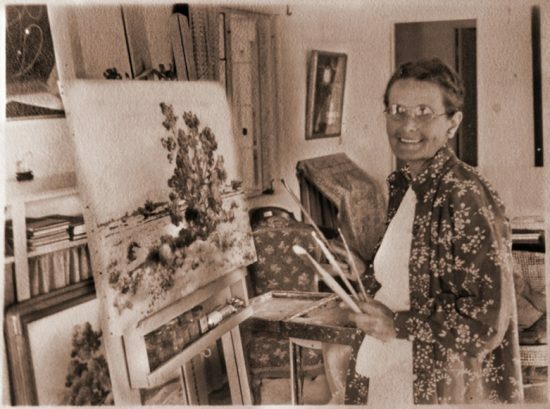 Ever since, I’ve been on a search to acquire one of her paintings. They aren’t easy to find. I finally located one that had been put up for auction. The only problem was that I had never been to an auction, much less purchased a painting at one. I envisioned the big expensive auction houses like Christies or Sotheby’s and I was afraid I’d be intimidated. Undaunted, I headed to the John Moran California and American Fine Art Auction last month in Pasadena. I was relieved to find that this public auction was held at the Pasadena Convention Center and the staff members could not have been more welcoming and helpful. Ultimately, I came away with not only my prized painting, but also some tips to share that could make a similar experience fun and successful. First, viewing art at an auction is very different than seeing a painting in a gallery. Bring your imagination! I overheard one woman viewing the Agnes Pelton painting say to her friend, “It looks like something from my grandmother’s attic.” Since the paintings are sold “as is,” it helps to be able to visualize the painting cleaned and in a new frame. The next challenge is in staying calm. The room can suddenly come to life when an anticipated painting comes up for bid. 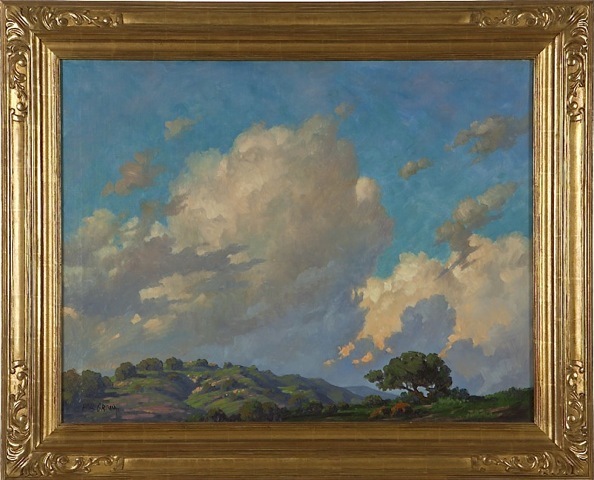 One of the stars of the John Moran show was Paul Grimm’s California Clouds. From a private collection in Orange County, the 28″ x 36″ painting sold for a record auction price of $25,000 – far above the suggested price range of $7,000 – $9,000. The bidding for California Clouds was an exciting few minutes during the auction evening. It was obvious that many people in the audience were familiar with Grimm’s paintings. As the bid amounts climbed quickly, the audience became energized with someone yelling, “That’s a record!” when the hammer came down at $25,000. You may have to wait for a while until the painting in which you are interested comes up for bid. In the meantime, anticipation is growing. Suddenly “your” painting is up! It is exciting. My heart was pounding and I was literally sitting on the edge of my chair. With the excitement and the pace of the bids flying in, it is easy to actually bid against yourself. I admit to being so swept up in the moment that I did this. Fortunately, the auctioneer looks out for you, and this one was kind and helpful, making sure that I didn’t get caught up in the bidding frenzy. Speaking of getting swept away, don’t do it. If you’ve got a competitive nature, watch out! There was at least one other person bidding against me for the Agnes Pelton painting. However, I had done some research and set a price limit for myself before I went to the auction, and I knew exactly where I was going to stop bidding. But, boy, it would have been easy to keep bidding in the heat of the moment. Fortunately, whoever was bidding against me dropped out right before I reached my limit. Once I “had” the painting, the next step was purchasing it. I didn’t realize that the manner in which you intend to pay for the painting is important. The buyer’s premium you are charged in addition to the auction price is less if you pay with a check or wire. The buyer’s premium I paid would have been discounted if I had paid with cash, check or a wire transfer instead of a credit card. The Pelton painting purchased by Noma Bruton. Overall it was a fun and exciting experience. Next time, I’ll plan to include a meal at a nice restaurant and make a day or evening out of the event. Best of all, I had the winning bid for the Agnes Pelton painting, a lovely desert landscape. One of the joys of art and collecting is finding a piece you can enjoy for years to come. 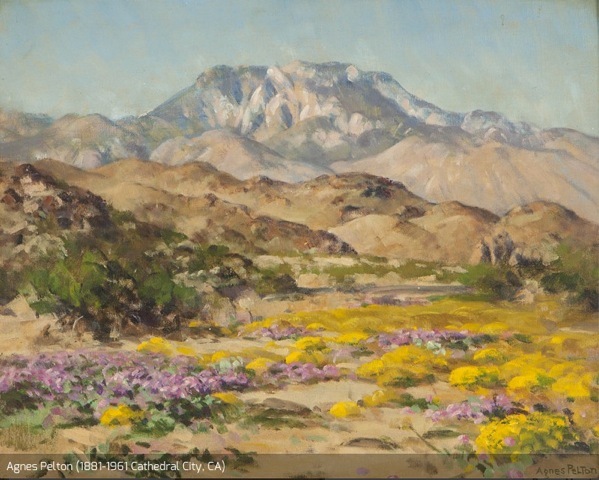 John Moran holds two California and American Fine Art auctions each year, one in the spring and one in the fall. The next one is scheduled for October 24, 2014. Noma Bruton is a Southern California banker. She and her husband purchased a home in Rancho Mirage in 2005. A historian by hobby, Noma quickly developed an interest in California desert art and began collecting in 2010. I can relate to it remembering the emotions when John Moran in Altadena sold my William Wendt. Exciting!……..I think the Grimm was well worth the winning price. Congratulations on your Agnes Pelton acquisition! A great story, good advice for auction goers. ……and now you are a proud owner! Congrats! Next time you must “eat to celebrate! Great story! I first acquired two Agnes Pelton paintings in 1989. In the early 1990’s a Chicago art collector was seeking specifically for Pelton paintings, and I sold one of mine to her. I have regretted that ever since.